HandKrafted by Stephanie: Taylored Expressions December Key Ingredients Blog Hop! 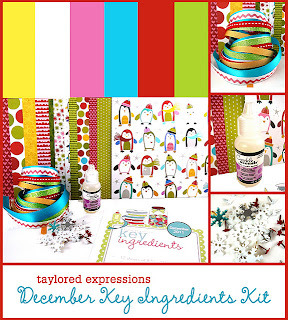 Taylored Expressions December Key Ingredients Blog Hop! Hello! Welcome to the December Taylored Expressions Key Ingredients Blog Hop! Today, we are showcasing the December Key Ingredients! Each month, the team shows you 6 days of projects on the Key Ingredients blog to get your creative juices flowing. In case you missed any of this, please be sure to check out the Key Ingredients blog HERE. This month's kit features patterned paper from the Bella Blvd Christmas Wishes collection, coordinating cardstock, ribbon, brads and a mini bottle of Crackle Accents. Christmas is just 5 days away, but this kit is not just for Christmas projects! 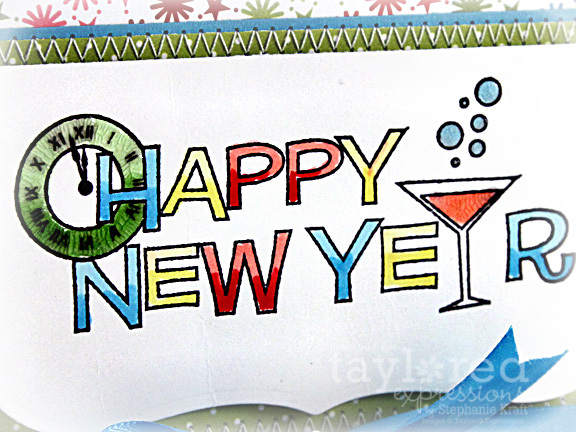 After making my set of cards for the Key Ingredients blog earlier this month (click here to see full set), I received the Happy New Year A la Carte stamp and had to make another card with this fun word image. 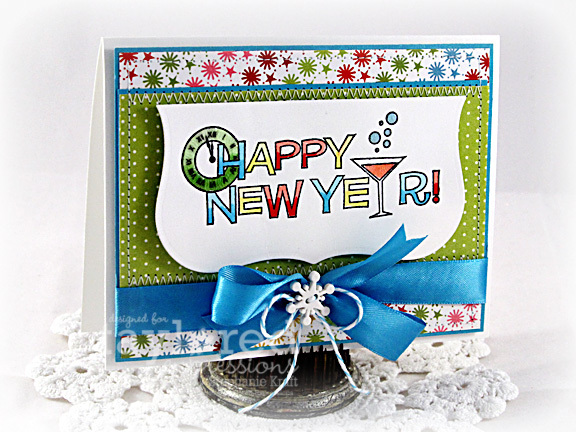 I used Spellbinders Grand Labels One Nestabilities to die cut Happy New Year and colored with Copic markers. I cut the die cut in half and popped it onto my card with foam tape. The patterned papers, Ribbon and snowflake button are all part of the December Key Ingredients. Accessories: Grand Labels One Nestabilities (Spellbinders), Markers (Copic), Ribbon, Snowflake button, Crackle Accents (December Key Ingredients), Baker's twine, Foam tape, Thread, Sewing machine. This is so fabulous! I love the half die cut panel and that's one of my newest favorite TE stamps too! Just wonderful! Love the papers, the stitching and super New Year sentiment. Have a good one! What a festive card Steph! Love the image and the colors. The papers are so pretty! I love the stiching and the snowflake in the middle. :o) Happy Holidays to you and your family! What a fun card Stephanie! Love the bright / cheerful colors! Love the crackled clock! How lovely, Steph! Bright and fun and beautifully put together as usual! If we don't *speak* before, have a most fantastic Christmas honey!